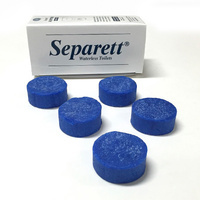 Separett latrine seat urine diverting. No odour. 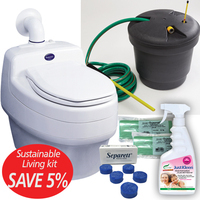 Urine-separation kit with insulated polystyrene seat and lid, turns an existing outdoor toilet into an odourless latrine. 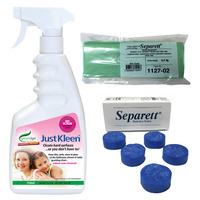 The Separett Privy 500 urine-separation kit features an insulated polystyrene seat and lid, and can be easily fitted to an existing outdoor toilet, to provide odourless operation. Urine is diverted in the 'bowl' area, to ensure that the solids and the urine are kept seperate and do not mix in the solids tank. This way, latrine type odours disappear and the substantially reduced solid waste is easier to deal with. The urine is routed via a hose to a soakaway or tank, such as the Separett Ejektortank. 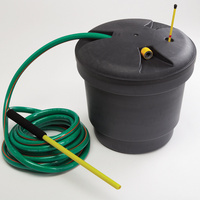 The contents of the Ejektortank is dilute with water (1:8) so that the diluted solution can then be used as a nitrogen fertiliser for lawns or trees. 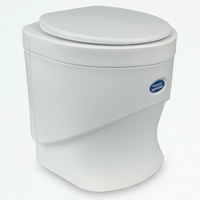 The Privy 500 comes with a standard size insulated toilet seat attached to the separating kit with a lift off lid. 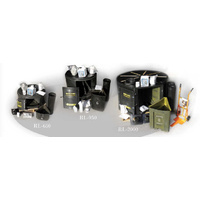 Biodegradable bags for solids and paper are available as an optional extra. 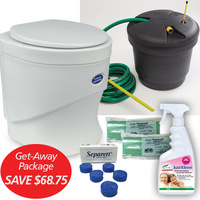 Please note: The packaging for Privy has a template that can be used to easily fit the Privy to your existing outhouse. Seperator Impact resistant high gloss Polypropylene. Recyclable. Dark Blue. Recyclable cellular plastic (Polystyrene). Light Blue.